Millions of families have trusted Wisk since its start in 1956 as the first liquid laundry detergent and stain fighter. 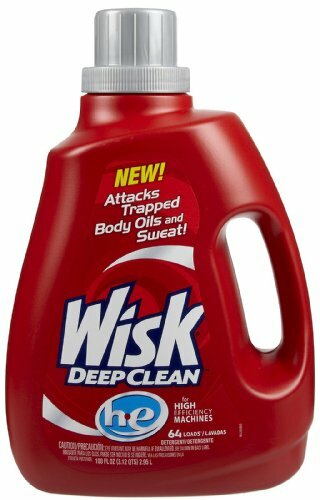 Wisk Deep Clean Laundry Detergent is a powerful new formula that provides a deeper clean, penetrating deep inside fabric to attack and help remove hidden body oils and sweat in laundry. While powerful, Wisk is still gentle on clothes and skin. This formula is specially made for high-efficiency (HE) washing machines. Its wonderfully fresh scent leaves laundry smelling clean for days. This package includes four 100-ounce containers of Wisk Deep Clean Laundry Detergent for HE Washing Machines. Wisk Deep Clean Laundry Detergent is a powerful new formula that provides a deeper clean, penetrating deep inside fabric to attack and help remove hidden body oils and sweat in laundry. While powerful, Wisk is still gentle on clothes and skin. This formula is specially made for high-efficiency (HE) washing machines. Its wonderfully fresh scent leaves laundry smelling clean for days. This package includes four 100-ounce containers of Wisk Deep Clean Laundry Detergent for HE Washing Machines. If you have any questions about this product by Wisk, contact us by completing and submitting the form below. If you are looking for a specif part number, please include it with your message.